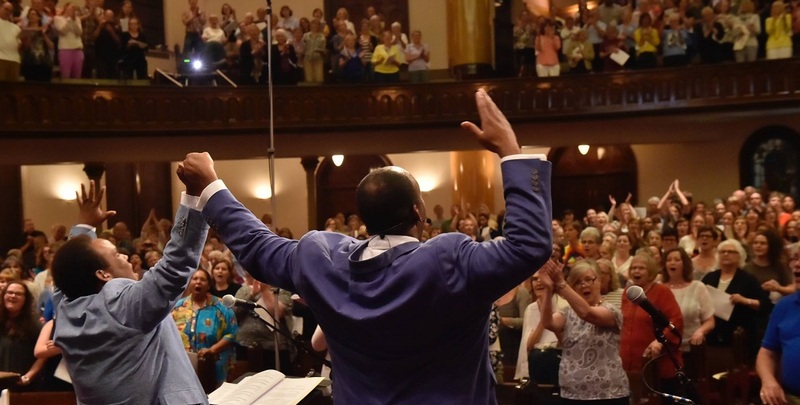 As a professional choir conductor for 20 years, I’ve learned to read the subtle cues in the room before the singing starts, but I’d never before experienced a feeling quite like the one at Westminster Presbyterian Church in Minneapolis on that July night. It was only a week since the tragedies in Falcon Heights and Dallas had ripped the fabric of our communities, and that night, along with Minnesota Public Radio’s Tesfa Wondemagegnehu, we were doing some mending, if only a little bit, through a community sing-along. One thousand miles south on 1-35, people were gathering in Dallas’ Meyerson Symphony Center for the same reason, and at some point in the evening, hopefully, technology would allow us to join our voices with theirs. Current events had left so many weighed down by feelings of shock, horror, disbelief, and powerlessness. Was it misguided to think an act as simple as community singing could bring some relief? Maybe I was the wrong person to ask. My whole life, I’ve been a witness to the transformative power of voices joining in song. As a conductor and leader of education programs with the choral music organization VocalEssence, I’m surrounded by people whose lives have been so enriched by group singing that they dedicate themselves to bringing the experience to others. Song has been there for me when I’ve felt alone, has given me a way to reach out and find connection. 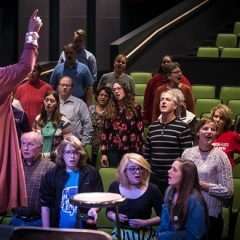 It’s helped me, an African-American man from Georgia, become part of a community in Minnesota, a state with a rich choral tradition. I’ve conducted choral groups all over the United States and traveled abroad to stand in front of choirs in England, Russia, Finland, Estonia, France, and Germany, and it never fails to thrill and surprise me, that palpable change in energy in the room when dozens breathe in as individuals and out in a single, unified, multifaceted voice. When you’ve felt this electric surge, this lifting up, you can’t help but wonder how you can bring it to others who might need it. At VocalEssence, our focus is on building connections and community through the power of song. We look for places where the social threads that tie us together might be loosening, and use song to bind us back together. A few years ago, new research convinced us that regular group singing could make a huge positive impact on the lives of our oldest citizens. With their health and mental faculties in decline, and retirement and economic decisions taking them away from regular social connections, the elderly population too often can become victims of isolation and depression. We launched a program, VocalEssence Vintage Voices, to bring song into the routine of seniors where they live—at residential facilities and senior centers, providing them with sensory-rich activities designed to reduce depression, as well as increase engagement, joy, and self-esteem. We rehearse with them weekly, teaching sometimes-novice vocalists how to read music and follow the conductor’s signals, and after two months, they put on a real concert, open to the public. We’ve had a tremendous response, with seniors delighting in the weekly gathering and the emotional experience of working all together, creating art together, expressing joy, energy, excitement together. Song is a source of power that a community can tap into, to unite, to inspire, to affirm our commitment to each other as neighbors, coworkers, altos, tenors, sopranos. I can’t explain why it works. But I’ve seen it happen enough to give me faith that it does. So that July night, a thousand of us quieted down, came to attention, and awaited a signal from my co-conductor Tesfa Wondemagegnehu. A thousand different people, a thousand different life experiences, and maybe even a thousand different opinions on how to repair the damage done to our communities: they were the raw material. But I had faith that in the next second, when we started to sing, we would unite as one. 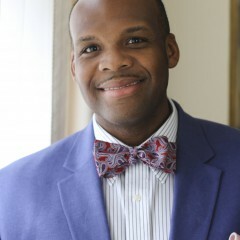 G. Phillip Shoultz, III is the associate conductor and education program director of VocalEssence. VocalEssence presented The Voyage, a concert about kindness, and creating a path out of loneliness, on Oct. 16, when Shoultz conducted alongside VocalEssence founder, Philip Brunelle. It also presented a community sing with Alice Parker and Ysaÿe Barnwell on Saturday, October 15, and will have an addition community sing this year on Friday, January 13, 2017 with Melanie DeMore.